Learn about crystals and how they form before making your own rock candy. How does popcorn come from corn on the cob? Discuss this and so much more about the wonders of popcorn all while enjoying it right from the bag. Teach your kids about metamorphic rocks and the rock cycle by pressing warmed Starbursts together. Using different colored candies will make it easy to teach about layering. Learning the different phases of the moon cycle doesn’t get much tastier than this! Carve (orrr…lick) the frosting on black and white Oreos to make an easy display of the 8 phases. Understanding genetics just got unbearable fun! Use different colored gummy bears to show how genes are passed from one generation to the next. You can find grizzly deals on bulk gummy bears on CandyStore.com. Pizza boxes, aluminum foil, and cling wrap will make for this melty experiment about heat and energy. Solar oven s’mores are always a hot project in my classroom and I keep going back for s’more year after year! Teach children about the Scientific Method and making predictions by watching the S magically float off of candy Skittles. I LOVE the reaction this experiment gets from kids (and me too)! 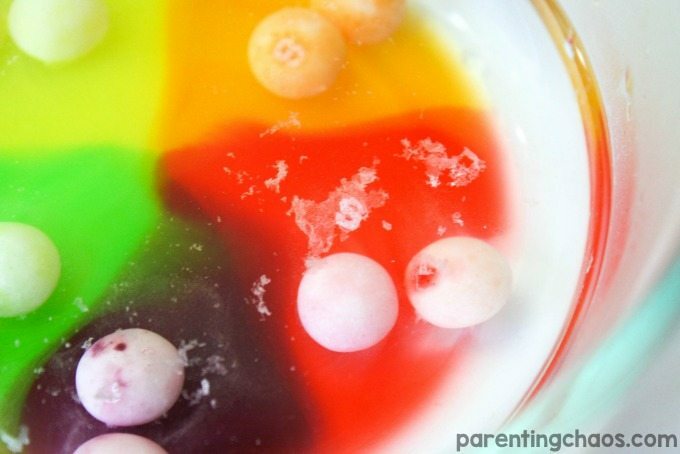 Kids will love to put their engineering hats on with this gum drop experiment. Spaghetti or cooking skewers can be used in place of toothpicks if you’d like to make taller structures. Using cookies and few “excavating” tools will have the process of weathering play out right before your eyes. No eroding brains around here! One of my students’ favorite science lessons each year is understanding how cream turns into butter. They love watching the transformation as they take turns shaking a jar full of cream and they especially love sampling the butter on fresh bread at the end! Michael’s sells mason jars in any size and shape you might need. Dissolving jelly beans in various liquids is a fun way to put some extra spring into your scientific endeavors. Which liquids will dissolve the jelly beans the quickest and most efficiently? Why?